The Hardy Cup has made its way back to the province of Manitoba. On Saturday afternoon, the University of Manitoba Bison football team dethroned the Calgary Dinos at the top of the Canada West conference, winning 27-15 at McMahon Stadium. 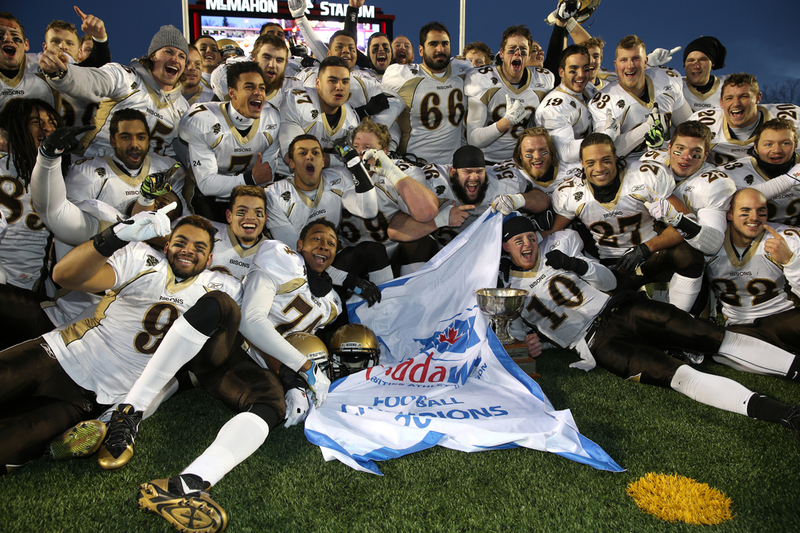 The Hardy Cup win was the Bisons’ first since 2007, when they went on to win the Vanier Cup. The victory was also Manitoba’s first-ever post-season win on the road against Calgary, who had won six straight conference titles heading into the weekend matchup. The turnover battle made the difference in this one, as Calgary conceded 10, compared to none from Manitoba. The Bisons’ secondary had arguably their best performance of the year, holding Canada West MVP Andrew Buckley to 224 yards passing, along with four interceptions – the same number of picks Buckley threw over the entirety of the regular season. Things got off to a shaky start for Manitoba, as Calgary running back Mercer Timmis shot through the line for an 81-yard rushing touchdown on the first play from scrimmage. Despite going down early, Manitoba stayed composed, tying things up on the shoulders of their defence. Jonathan Jones jumped a route in the flats, taking it back 20 yards to the house to tie the game up, less than five minutes in. The Bisons grabbed the momentum after the pick six. They took their first lead of the game with 7:47 left in the first quarter. Kienan LaFrance found a hole, made a few defenders miss, and rumbled 40 yards to the endzone, capping off a three-play, 75-yard drive. Both offences stalled until a missed Manitoba field goal less than two minutes into the second gave Calgary some life. The Dinos retook the ball after a failed 37-yard attempt from Ryan Jones, and capitalized with a five-play, 90-yard drive of their own. Rashaun Simonise hauled in a pass on a slant route, and utilized his breakaway speed to tie the game up at 14, on a 42-yard reception. The game would remain tied for less than four minutes, as Manitoba secured the lead for good, on a 17-yard Jones field goal. The three points came off of the second forced turnover by the Bisons, as Colton Farago stripped Dino returner Michael Klukas, and Brett MacFarlane recovered the ball on the Calgary 10-yard line. The fumble recovery by MacFarlane marked the first of four consecutive drives where the Dinos turned the ball over. Backup QB Eric Dzwilewski failed on a third down conversion, two straight interceptions, thrown by Buckley, followed – the first to Tyler Fong, and the second to Cam Teschuk, who stole the ball from the outstretched hands of Simonise. The Fong interception resulted in a touchdown for the Bisons, as QB Jordan Yantz found Zach Regert from seven yards out on the ensuing drive, to take a 10-point lead heading into the break. The second half produced a total of just four points, with a single from the Dinos, and a field goal from Manitoba to round out the scoring. Manitoba’s defence shut down the highest scoring team in the nation in the final two quarters, forcing five more turnovers, including two failed third down conversions, a fumble recovery by Evan Foster, and interceptions from halfbacks Jayden McKoy and Jordan Linnen. Calgary also lost Buckley to a hamstring injury midway through the third quarter. Dzwilewski entered the game in relief, producing 105 yards, no touchdowns, and one interception. Yantz did an effective job managing the game for the Bisons. He finished with 263 yards, one touchdown, and no interceptions. 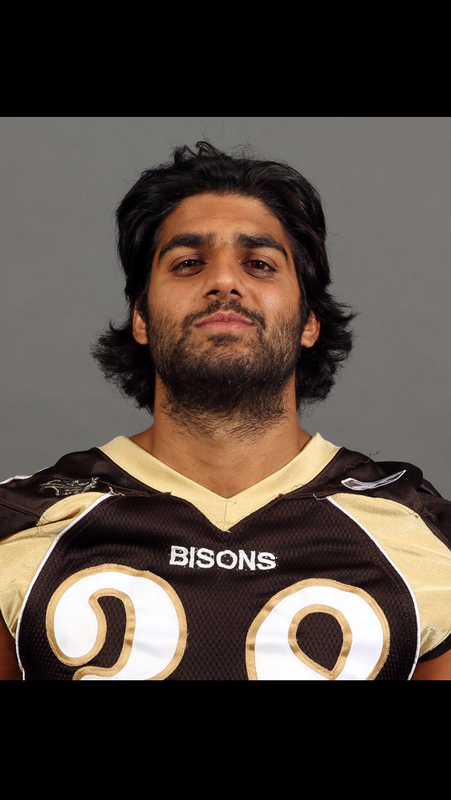 LaFrance was the biggest playmaker offensively for Manitoba, putting in a workhorse effort. He carried the ball 30 times for 155 yards and a touchdown. The Winnipeg product was pleased with the way the team has come together all season to get to this point. “There’s not a group of guys I’d rather be sharing this victory with. Everyone had put in so much work to get where we’re at, and it’s finally paying off,” LaFrance said. On the defensive side of the ball, DJ Lalama led the way, with eight total tackles. Lauren Kroeker and Foster put in strong efforts from the end positions, both recording four tackles, with Kroeker adding a sack. After him romping 81 yards for a score on the first play, the Manitoba defensive held Timmis to just 52 yards rushing for the remainder of the game. The Bisons will now head to the CIS National Semi-Finals in the Uteck Bowl to take on the second-ranked Université de Montréal Carabins on the road. Game time is Saturday Nov. 22, at 11:30 a.m. CT. This will be the first time the two teams have ever squared off.